A successful agile transformation driven by a people and culture team. This week, guest bloggers, The Agile Eleven, show how they helped to roll out agile ways of working for a retail asset management group. Eduardo Nofuentes, Founder / Enterprise Agile Coach at The Agile Eleven, joins us for our September HR Roundtable. 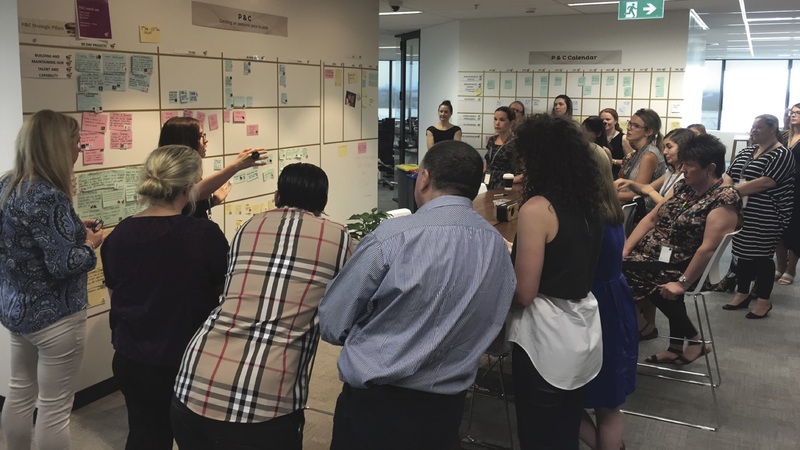 In February 2016, we (The Agile Eleven) were engaged by the People & Culture (P&C) team at Vicinity Centres (VCX): not to drive an enterprise-wide program, but to simply help them roll out agile ways of working for the P&C team. Instead, agile was introduced across the organisation, resulting in a remarkable company-wide transformation perhaps demonstrating a new way of approaching organisational change. Vicinity Centres is a leader in retail asset management and was created in June 2015 through the merger of two of Australia’s major retail property groups. Vicinity is a top 50 ASX listed business owning approximately $14.9 billion in retails assets and managing some $24.5 billion in assets across more than 80 shopping centres in Australia. Some of their centres include iconic brands like Chadstone, Emporium, Chatswood Chase Sydney and DFO to name a few. Vicinity employs approximately 1,300 people across Australia. Our partnership with the P&C team at Vicinity is now approaching two years. In that time we have come to work with nearly all the teams in the organisation, supporting a large number of cross-functional initiatives and advising on strategic matters. This supports our view that to truly achieve organisational agility, an organisation needs not only to transform the way teams work (ways of working), but also the way the organisation looks at their portfolio management (lean enterprise approach) and the way strategic decisions are made (organisational agility). SO, WHAT ARE THE RESULTS ACHIEVED SO FAR? The first noticeable result from our work with individual teams was an improvement in communication and collaboration. An early survey with some of the teams we introduced agile ways of working to, returned very high scores with 100% and 92% of people agreeing communication and collaboration had improved. Changes to the teams’ ways of working, along with other key initiatives driven by P&C, yielded a significant improvement in the Employee Engagement Survey results; which went up 5 points overall in the first year and as high as 33 points in some of the individual teams. It is important to note that the company had just been through a merger, which would typically be expected to drive employee engagement scores down. A more engaged workforce helps drive a stronger Employer Brand, and reinforces the Employee Value Proposition; making it easier to retain and attract the right people for the organisation. In what is generally an uncertain post-merger environment, Vicinity has been able to settle quickly and get on with successfully running and growing the business. With more engaged people, empowered teams and extensive cross-functional collaboration Vicinity is strengthened in its ability to amplify opportunity and respond quickly to the disruptive environment impacting the retail sector worldwide. SO, WHAT HAVE BEEN THE KEYS TO THIS SUCCESS? While we had the support of the senior leaders to undertake the work, it was never a top-down initiative. Participation for teams was optional, with teams choosing to work with us on timelines that were suitable for them, and we followed this pull approach throughout the journey. This made it a safe environment for teams and leaders, and facilitated powerful organic growth. We did not implement frameworks or large-scale methodologies. Instead, the focus was on introducing agile mindsets and principles across the business and then teaching and applying different tools, practices and solutions for every team / initiative depending on their needs. This customised approach has helped create an environment of empowered leaders and teams that evolve and improve their agile practices to their own beat. The final key was to enable Vicinity to lead the transformation; and not us, the consultancy. While we might know what true agility looks like for other organisations we work with or have studied, we don’t believe in shoehorning a company into an approach they are not comfortable with. We feel strongly that our role is to show the client what is possible and they let us know what feels right for them. We then help to achieve it together. While the agility journey at Vicinity Centres continues – it really doesn’t ever end – they now find themselves in a much stronger agile position than they were two years ago. The company has survived a major merger creating a strong and attractive employee value proposition and is now better positioned to reimagine and reinvent the way we experience retail in this country. The Agile Eleven are leaders in implementing agile thinking, working extensively across all business areas, from executive teams to people & culture, sales & marketing to operations, finance & accounting to IT; and with clients across Australia, North America and Asia.